Don't you just love chocolate and peanuts -- together? Creamy chocolate and crunchy peanuts. Creamy melted chocolate and crunchy peanuts. Sweet, creamy melted chocolate and salty, crunchy peanuts. Sweet, creamy melted chocolate covering clusters of salty, crunchy peanuts. 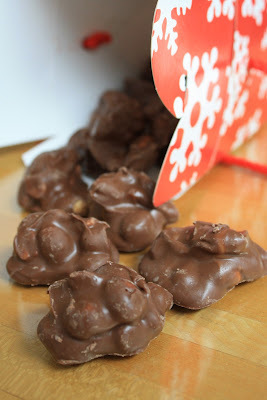 Who knew it was so easy to make chocolate covered peanut clusters at home? And who knew they would be so much better than any store-bought chocolate peanut clusters? You've got to make these. And make some to give as gifts. Your family and friends will thank you! Here's the recipe, thanks to my friend and neighbor, D.R. Layer the ingredients in a slow cooker in the order listed. Cover and cook on Low for 1 1/2 hours - DO NOT PEEK. Remove lid after cooking and stir ingredients together. Drop by teaspoon onto wax paper - a small cookie scoop works well. Leave several hours or overnight for chocolate to harden. Store in airtight container. have been planning to make this, but I am actually afraid to- afraid I will eat half of it before it ever hits containers!! !